President Trump's tweets delight supporters who say they find him honest, funny and refreshing. But his tweets distract and dismay his detractors, alienate many of his allies and misdirect much of the media. Trump's tweets delight those supporters who say they find him honest, funny and refreshing. By the same token, his tweets distract and dismay his detractors, alienate many of his allies and misdirect much of the media. Yet as a substantive matter, these staccato statements cannot be ignored. They serve up invaluable insight into the workings of the president's mind, a rich resource for historians and one that journalists mine in real time — as do Trump's own aides, who scroll through his account to figure out what he is thinking. Clearly, attention must be paid — just not to exclusion of the impact of actual policy, executive orders, laws and the like. And major outlets are actually doing a pretty good job of covering those weighty matters. It has been said that a president's character is revealed in moments of crisis. Trump's character may perhaps be best revealed in bursts of 280 characters or fewer. On one hand, the public is getting an unfiltered and unprecedented view into the thinking of a sitting president. His immediate thoughts are not hidden or cast in carefully scrubbed prose. On the other hand, Trump often declines to appeal to the better angels of our nature. The social media messages are often Hobbesian: nasty, brutish and short. In February, Trump titled his retweet of a fan's image depicting an ancient Wolf Blitzer in blackface this way: "The Fake News of big ratings loser CNN." The president wrote that the Russians' efforts to disrupt the U.S. political system succeeded because of the investigations of his administration: "They are laughing their asses off in Moscow. Get smart America!" Trump even went after his own national security adviser, Gen. H.R. McMaster, for saying there was "incontrovertible" proof the Russians had sought to interfere with the 2016 presidential race: "General McMaster forgot to say that the results of the 2016 election were not impacted or changed by the Russians and that the only Collusion was between Russia and Crooked H, the DNC and the Dems." 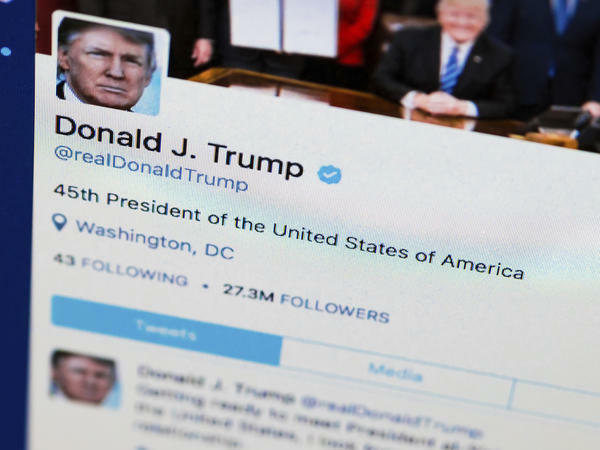 On Presidents Day, CNN's Chris Cillizza tallied these and other missives that he described as "totally unpresidential things" tweeted by Trump. All nine tweets on Cillizza's list had emerged in the previous 72 hours. A month later, Trump announced McMaster's subsequent firing (where else?) on Twitter. "Before social media, it was a lot more opaque," says journalist Emily Parker. "A lot of these conversations between leaders were happening behind closed doors, and we had no idea what was going on." As a State Department official under President Barack Obama, Parker pushed for government officials to use such platforms to offer greater transparency. "People always said, 'Oh, it would be so great if ... we could get more public figures on Twitter and if they could speak directly to the public and speak directly to each other.' "
Parker still thinks that is a good thing. Yet in retrospect, she concedes, instant transparency in the Trump era represents a case study in "be careful what you wish for." "Now you can have leaders literally fighting in public in front of the entire world," she says. The current U.S. commander in chief called North Korean leader Kim Jong Un, whose regime is developing long-range nuclear missiles, "obviously a madman" who "will be tested like never before." Last summer, an Australian psychology professor and a German management professor released their analysis of more than 35,000 Trump tweets over an eight-year period. They compared Trump to other entrepreneurial leaders and political figures and concluded that his competitive nature, his aversion to rules and norms, and his pursuit of change and creativity reflect characteristics that are important for successful entrepreneurs and political leadership. They also found his tweets reveal him to be "comparatively" neurotic. In comparing the president to other business leaders and politicians, the scholars cited models of behavior articulated by the early 20th century Austrian economist Joseph Schumpeter. Our president is more of a Trumpeter. Trump sets policy, settles scores and swaps out personnel more on Twitter than in any forum. Obviously, news organizations must examine laws, policies, regulations and all the rest — and they are, intently. But to turn off Twitter is to embrace blind spots about this president. On Twitter, Trump called his own attorney general, Jeff Sessions, "disgraceful." Just before the election, a tweet initialed personally by Trump from his campaign account trafficked in some fairly common anti-Semitic language: "Hillary Clinton meets in secret with international banks to plot the destruction of U.S. sovereignty." There are journalists and political figures who are adherents to a school of thought that says, simply: Turn away. Trump adviser Kellyanne Conway says she is among them. She argues that the media uses his tweets to gin up airtime, stir controversy and save itself from the hard business of covering government. "I know it's a heck of a lot easier to cover 140 characters here or there or what the president may be saying about the media here or there than it is to learn the finer points of how Medicaid is funded in this country," Conway said last summer. Her boss's own demonstrable lack of interest in the finer points of policy was once more proved on Thursday. Trump made an unsupported claim that women coming to this country from Central America illegally are being raped at "levels that nobody's ever seen before." He then literally tossed the pages of his prepared remarks on tax policy in the air, calling them boring. That Conway appearance last summer played out on Fox & Friends. It is a program that Trump watches closely — and from which he takes direct inspiration for speaking points and policy priorities. Especially on Twitter. At the outset of the Trump administration, one media critic argued that newspapers should set aside a small box daily on a page deep inside the national section to handle his tweets: Cover it, but don't give it front-page or top-of-the-newscast treatment. That critic would be me. Trump's frequent estrangement from the truth in his tweets is so complete that it defies belief. Consider, his claims that Amazon's shipping business costs the U.S. Postal Service billions. By federal law, the USPS cannot deliver packages for less than cost. Yet Trump's attacks on Amazon (due at least in significant part to his frustration with The Washington Post, privately owned by Amazon founder Jeff Bezos) at least temporarily shaved more than $50 billion from that company's market value. Covering such tweets intently often leads to the debunking of claims that absent presidential authorship would not have deserved circulating, much less checking and debunking. Yet I'm not sure that my proposed approach of relegating Trump's feed to the back pages would have fully captured the state of play for the administration's policy reversals, personal slams and personnel changes. Millions of people are sharing his thoughts, whether through MAGA hashtag advocacy or through hate-tweeting. Columbia's Jaffer sued the president on behalf of several online critics whom Trump (or his aides) had blocked on Twitter. Jaffer says the nature of the platform makes a tweet like part of a city council meeting, promising a back-and-forth, not a one-way televised address. Blocking those critics prevents them from participating in public debates, Jaffer says, inhibiting their free speech on matters of public policy. Of course, that isn't all Trump does. "He also uses it to insult people and to make bigoted remarks," Jaffer says. "I don't think there's any question but that he's lowered the tenor of political debate, and the Twitter account is maybe the largest part of it." Take Trump's retweeting of anti-Muslim material posted on accounts operated by British far-right groups. Twitter has promised repeatedly to crack down on hate speech and took down the accounts of those groups. But it did not accede to the calls by some of Trump's critics to suspend his account as well (though it was briefly taken down by a rogue Twitter employee). Jaffer, a former lawyer for the American Civil Liberties Union, agrees. Trump's tweets play best among his true believers, but his tone is often willfully divisive rather than conventionally presidential. His feed is an ever-changing mood ring, often full of sound and fury, signifying sound and fury. Which we probably need to know about the person in the Oval Office. And which he serves up.